Last weekend, we left no stone unturned as we moseyed from Santa Cruz to Carmel-By-The-Sea hunting for treasures and sightseeing. We hit estate sales, yard sales, antique malls and design stores. I'm pretty lucky Mr. A enjoys the thrill of the hunt too! We started at Center Street Antiques in Soquel, a sleepy suburb of Santa Cruz because Atelier de Campagne has a booth there and I was anxious to see their display. I've been following their blog and even met Trinidad and Johan at the flea market earlier this month. Their booth was one of my favorites, so beautifully staged with amazing antiques from Europe. In fact, this collective had the best dealers. Every booth was a good one. Which is rare these days. With antique collectives going by the wayside, it was refreshing to see one still flourishing. Not only is this one of the best malls I've ever been in, the prices are very reasonable too. I bought this pillow for my BFF Maureen. It matches the drapes in her living room. Great vintage leather suitcase. It had all original stickers including one from Havana! A little glue on the handle is all it needed. There were more than a few tole trays, but I left them behind. A wonderful old wicker trunk. Would be great at the end of the bed. Shopping at this collective brought back memories of the time when I had a booth in a local mall for about 7 years. It was so much fun and a lot of work. Mr. A suggested that maybe I should think about getting back into the antique business again. Perhaps an online store, he suggested. He just wants to get rid of all the stuff in the garage! It was only 11:00 am and the day was just getting started. Stay tuned as we head south touring Monterey and Carmel. What a great pile of goodies!! I LOVE those pillows!! Oh, it is so much fun to hunt with your sweetie! I miss that! We used to live in the Atlanta area and would plot our day filled with Estate sales, etc...my husband always went for the tools and old Bibles...lovely You have found some marvelous treasures! More, more, more please. My mouth is watering. This is like a wonderful weekend with your husband! I love the suitcases. What a fun field trip. My hubby also willingly tags along to some of my expeditions...love the details of your trip. I live in California so I'm making a list of names of places I will want to visit. I love these kind of field trips! 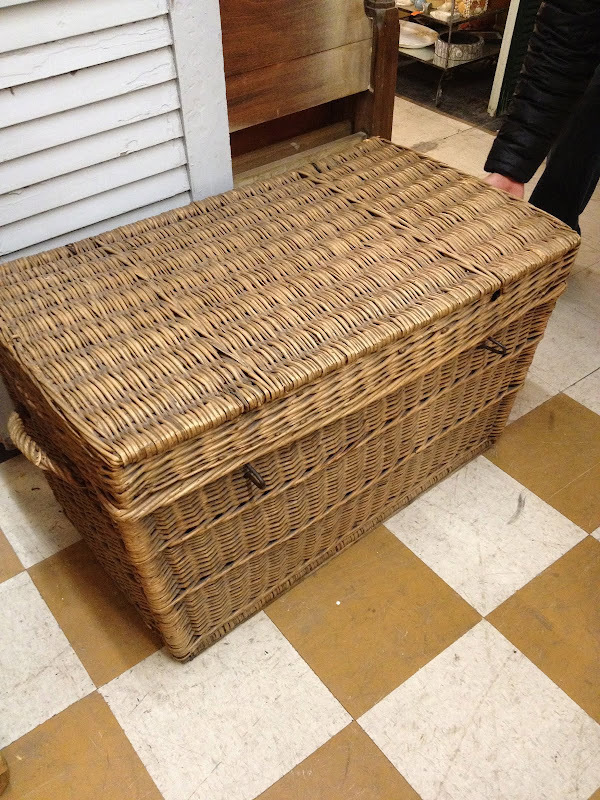 That wicker trunk would have come home with me for sure! Now I want to go shopping! What fun you and Mr. A have...love that you guys just took off!! Love Center Street it is one of my favorite haunts! They always have something interesting! I hope you stopped at Crawfords, Warmth Company and Wisteria! 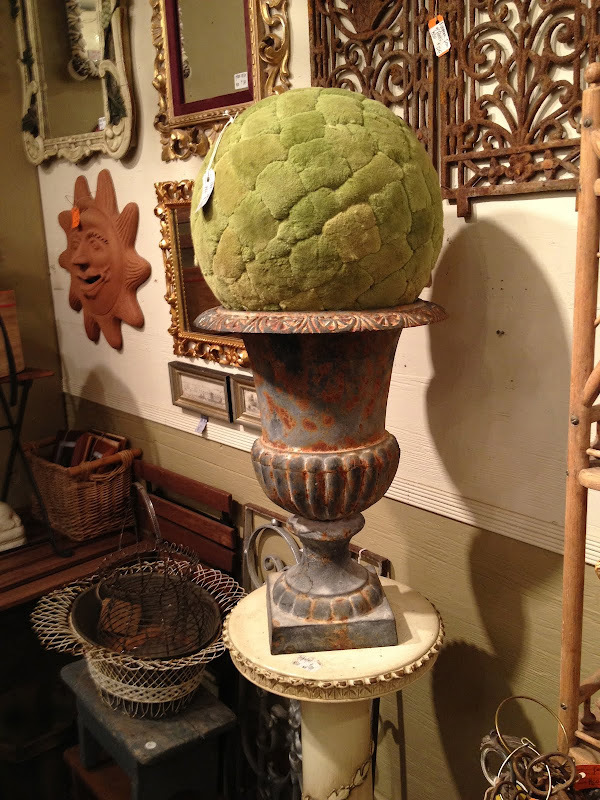 Have you visited the beautifully curated selection at Saffron & Genevieve in Soquel Avenue? I like Mr A's idea for you Delores - why not an online store? All you need is stock, a camera and a website, and it wouldn't tie you down, just add spice to the chase. And PS, it would be wonderful if you sold treasures on Etsy or EBay....we are all so taken with your style, you could travel the world spending money doing what you like to do....Also, if ever you come across a set of red or purple Bordallo cabbage chargers, I would gladly pay a million for them....I think they are now extinct and I am So amazed with how you are able to use yours in so many different applications...if I had just a speck of your artistic talent!!! what a fabulous mall! It was full of some great things! I would not have been able to leave that wicker trunk and suitcase behind! Step away from the Putti, they're mine! What a lovely way to spend a weekend. It used to be my favorite activity too when I lived in the Northeast. We don't have much in the way of antiques here in sunny SW FL though. Not that I have the room, although I would find room for that pair of cherubs in the first booth. Road Trip--what a great weekend you had! Everything is beautiful! Did you get the trunk and the suitcases?? You are so cute in your photos! 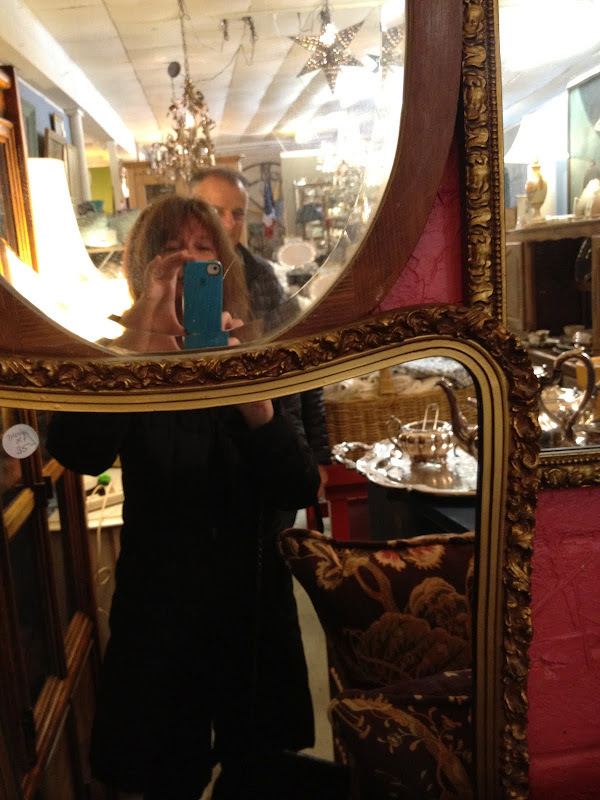 How much fun to have a hubby that likes to antique with you! Did you purchase anything yet? How fun that your hubby likes to go with you! Looks like your scored some great things so far! Can't wait to see the rest of your tour. Sounds like a dream trip!